That Fallout: New Orleans rumour – is there any truth in it? Hmm. Hrrrm. The rumoured Fallout: New Orleans doesn’t sound quite right, does it? Looking for a Bethesda fix? Here are our favourite Skyrim mods. Earlier today the internet noticed a trademark application filed with the EU Intellectual Property Office. Entitled ‘Fallout NEW ORLEANS’, it consists of nothing but a logo featuring the series’ signature bolt of atomic energy. No registration date is attached, nor any details that might link the filing more closely to the games industry. It’s not an irrefutable piece of evidence. For one thing: that logo looks rubbish, even for a purported placeholder. In fact it looks a lot like the blank lettering that pops up with a Google image search for ‘Fallout 4 logo’. For another, New Orleans doesn’t quite fit Fallout naming convention. New Reno, New California Republic, New Vegas… each of those titles takes a place from our world, bombs it to bits, and reassembles it as something recognisable but different. New Orleans? Already new. Get with the nomenclature, rumourmongers. Don’t get me wrong, New Orlean’s French quarter grandeur and radioactive swamp would make for an enticing setting. But didn’t Fallout do swamp already, when it went to Maryland with Point Lookout? 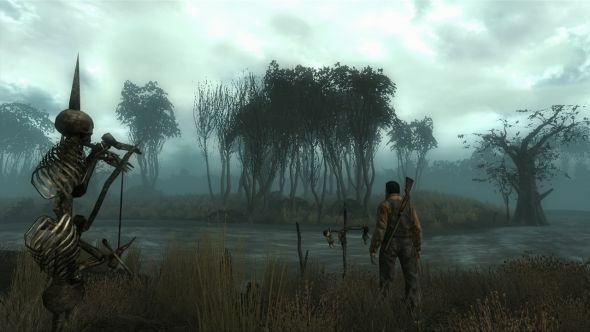 What’s more, an image of Louisiana-branded field notes posted back in December by New Vegas project director Josh Sawyer was soon confirmed to have nothing to do with the series. So this one doesn’t look too likely. But hey: a fake Fallout 4 ARG predicted that game’s move to Boston long before its announcement. Maybe this fake reveal will be proved right in time too.